The Blue Hills Reservation, managed by the Massachusetts’ Department of Conservation and Recreation (DCR), is approximately 7,000 acres of woods, ponds, wetlands, and elevated rock set aside by the Commonwealth in 1893 for its citizens to use and enjoy. It is centered on the Blue Hills themselves, a long sweep of steep, stony ridges rising 7 miles from Quincy’s historic granite quarries in the east to the massive dome of Blue Hill in Canton and Milton in the west. Recreational opportunities include non-motorized boating, camping, fishing, hiking, horseback riding, ice skating, mountain biking, picnicking, rock climbing, cross-country skiing, downhill skiing, softball, and swimming.The Reservation also offers other recreational and educational opportunities at Mohnihan Playground and the Martini Shell in Hyde Park, Ryan Playground in Mattapan, and Ventura Street Playground in Dorchester. Throughout the year, the DCR organizes many programs in the Reservation. There’s also an adult walking club. 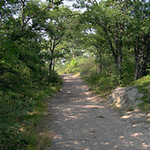 Listings of these hikes and happenings can be accessed at http://www.mass.gov/dcr/parks/metroboston/blue.htm. If you value the Reservation, a precious and irreplaceable resource, you may want to get involved with the Friends of the Blue Hills (FBH), a nonprofit volunteer group started in 1976 (http://www.friendsofthebluehills.org/). FBH works to preserve and protect the Reservation. They organize events at the Blue Hills, advocate for actions that will enhance the Reservation, and serve as a watchdog of activities that might adversely affect it. Another group dedicated to the preservation of the Blue Hills is Blue Hill Adventure and Quarry Museum (http://www.bluehilladventure.org). The organization leads recreational activities in the Blue Hills and along the Neponset River and conducts tours of various historic sites in Quincy, Canton, and Milton. It also maintains a two-window display at President's Place in Quincy showcasing relics and souvenirs of the granite industry and Quarries.